If your 9 to 5 job isn’t enough to make your ends meet or you are looking for ways to earn a little more, get your savings up or you just want to spend effortlessly on your desires and dreams, then earning a few quick bucks online can help you sort out your life seamlessly. In fact, if you do it right, you can even end up with a long term, consistent and sustainable income. How great would be that! And, if you think earn real money online requires rocket science, then, my friend, you need to check your facts right because it isn’t as difficult as it looks. Sure, you need to have the skill and will to excel here but, nothing over the top is required. Just the right approach, a little research in what you are looking followed by a disciplined routine towards your work is what you need to pave new avenues of online success. So, are you good to go and put your skills to some good use? Wondering what kind of approach would be right for earning money online? Well, feel free to help yourself while you take a look at these smart ways to earn real money online (quick and safe, of course). Here you go. One of the easiest and quickest way of making money online is certainly blogging. So, if you have exceptionally good writing skills, try setting up your own blog and see how it becomes an integral part of your passive income. Just a little knowledge and research on setting up the blog with a good domain name in the right niche with content targeted towards the right audience is needed to let you get going and making a sustainable income out of it. Email marketing is an imperative tool helping businesses get a competitive edge over others. In fact, if done correctly, you can earn up to $1 per subscriber in a month which means the larger is the number of your subscribers, the higher would be your income. So, you see how jumping in this bandwagon and making money out of it can be a smart way of having a recurring income. All you need to do is come up with an email software, target the audience, pitch them through mails while delivering value and being productive. Do you have great oratory skills? Then, why not try your hands at creating webinars? Just the knowledge of the topic you are talking about and the skills to deliver it in a way that makes audience understand and get hooked to it easily is required to earn exorbitantly well through webinars. Wondering where can you begin? Well, just create your own website, make your online presence count and see how your words make you wealthy in just no time. Sounds awesome, doesn’t it? Who said earning money needs to be a serious task always? It surely can be fun and engaging too. In fact, take my words when I say you can make money just by playing word games like online crosswords. Yes, try your hands at intricately crafted online crosswords like Wealth Words and see how you laugh all the way to bank by just answering its few puzzles right. How amazing is that! Imagine relaxing in the cozy comfort of your home, puzzling your brain through the extensive sessions of this crossword and winning cash prizes as huge as $1600. It couldn’t get any better so, don’t waste a second, just register at its website and paint the town red with your top notch puzzling skills. Aren’t these ideas pretty much enough to earn real money online with making dream? It certainly is. So, focus on them and earn real money online, a lot and lot of it. 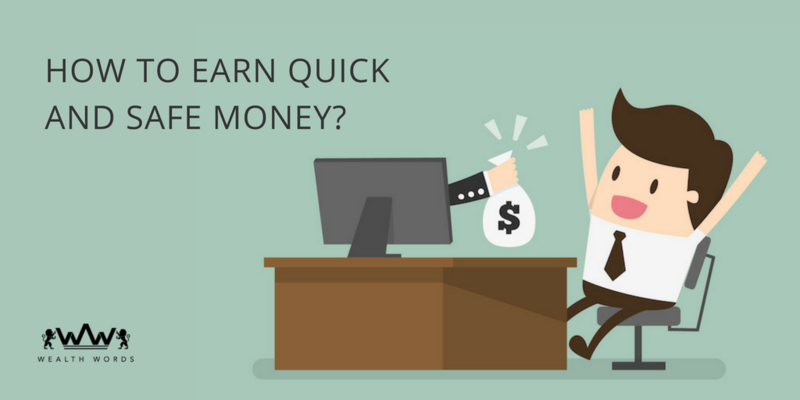 Because, if done right, these simple, real money online earning hacks can help you live the life of your dreams while you break stereotypes and get ahead of the rat race!